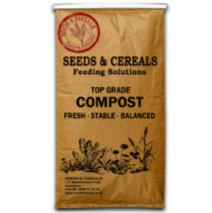 Seeds & Cereals Compost is a blend of rich spent mushroom substrate and fine bark mulch that has gone through a controlled decomposition process and cured for a set period of time. A stable and balanced compost suited to most garden situations. When fresh organic matter like bits and pieces of plant or animal come into contact with the soil it causes a surge of biological activity. This activity can cause soil microbes to draw nutrient away from the plant roots robbing them of important nutrient for weeks or even months before the process is complete and nutrient is freed up again. 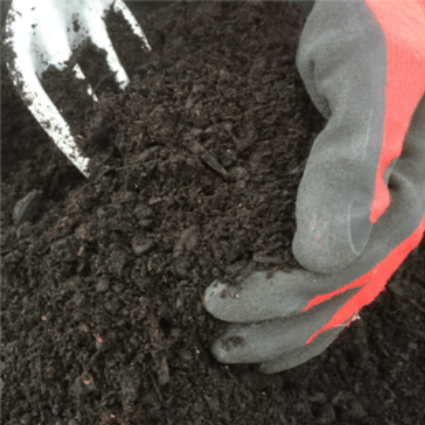 Seeds & Cereals compost is a blend of rich spent mushroom substrate and fine bark mulch that has been cured through a controlled biological process. The end product is a stable, well balanced, weed free compost ready to go on the garden without robbing important nutrient from the plants. Seeds & Cereals Compost is well balanced at pH of 6.5—7.0 this allows seeds, seedlings and shrubs to be planted directly into compost. However, if regularly using around acid loving plants like rhododendrons, azaleas, camellias and citrus etc… the addition of a little sulphur will be necessary to keep the pH in check. To get the best from a good quality compost it is best to spread it about two inches thick over the garden surface then work it into the first few inches of top soil where possible. Although this will have some immediate benefits the real benefits are when it starts breaking down to humus. Humus is the stuff that makes the soil look dark brown or blackish in colour, it is a result of slow but complex soil microbial activity. Apart from having a big influence on soil structure permeability and water holding capacity humus is where real plant nutrient is prepared. Applying a little sulphate of ammonia or blood meal during the growing season can accelerate the breakdown of compost.